Let me say it again in case you didn't hear. Praise be unto the most high. Here's to schedules, organization, structure, boundaries, and a well-rested child! (And Craigslist for the great find. I wanted to reply to Jennie's comment when she offered to send her crib tent to me but when I try to reply via email to a blog comment it won't let me. Is this due to my settings? It would be great to reply by email to some of your comments). Peter actually likes the tent. Who knew? Thank you to those who made Christmas donations to A Good Grief. What a wonderful gift you gave a family in need! My goodness. Now that Peter will be locked in his cage, I mean, napping again, I will be better at updating my blog and website. I hope you enjoyed Christmas this year. I felt a lot of peace and gratitude. It was wonderful. These boys really are similar. 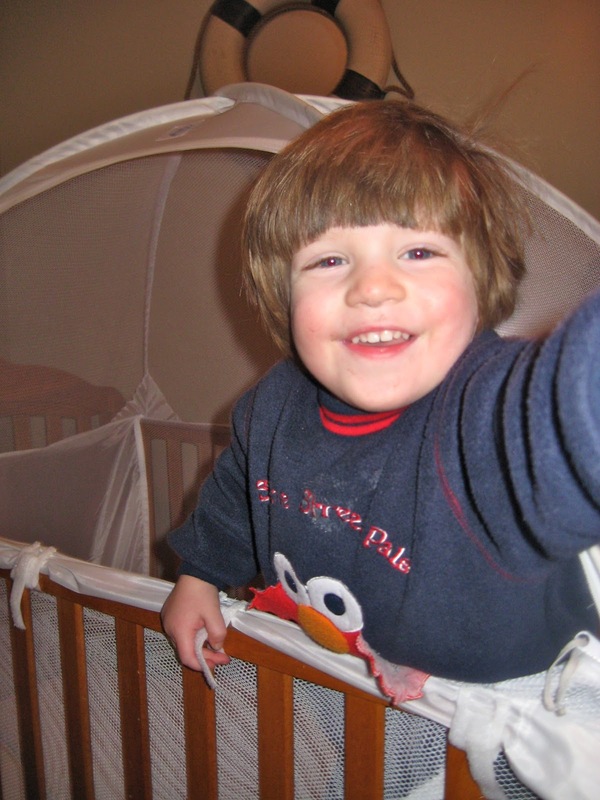 I could say that the crib tent saved my life (or his?). I am so glad that you discovered it and it is giving you some much needed peace and quiet. I had twins and can second that motion. As soon as they started to climb out I got one tent for each crib and it was the best decision I ever made. the most wonderful invention ever! Ours has been through 3 kids, and is duct taped together, but still works. We put glow in the dark stars above it, and the kids feel like they are camping every night. Seriously. the best thing ever. Amen and amen! Most of my kids have used it and it saves my life. Devin just started climbing out (at 25 months) and he is now caged in. Sidenote - we came to Utah for the holidays and I hoped we could get together, but time didn't allow for friend get-togethers. This summer we must! Thinking of you often. So glad Peter is sleeping better! Are you? I need about 37 more lunches together to feel like we are all caught up and thoroughly discussed of all important topics. Sigh.